Continuing our theme of making Take Paws a showcase for people having fun traveling with their pets (that means you! 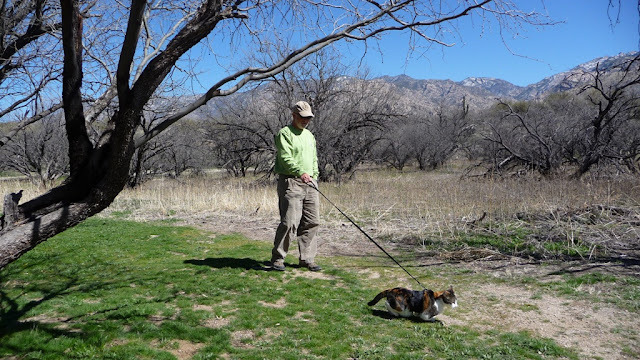 ), today we’re excited to have a guest post on cat travel from Lisa McGuire, who – along with her husband, Hans, and lucky cat, Rosie – lives full-time in an RV! We met this fun trio a few weeks ago, and I was tickled when I saw the care they’d taken to make Rosie comfortable in their mobile lifestyle. 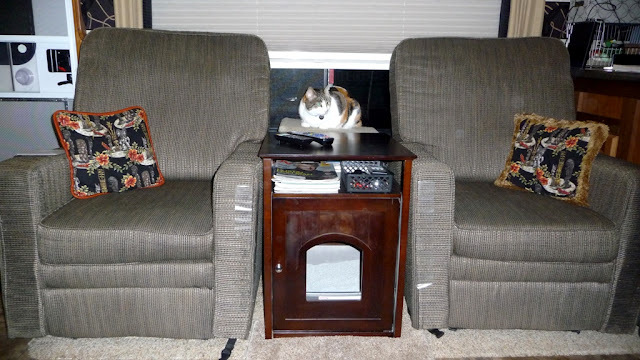 Transitioning adult cats to RV living can be a challenge, but Lisa and Hans prove that, with a little patience and creativity, anything’s possible. Hi! My name is Lisa and I live and travel full time in an RV with my husband, Hans, and our six year old Calico-Tabby cat, Rosie. We spent a couple of years researching and planning how we would live our lives when we retired in 2012. We knew we wanted to travel, but we kept hitting what seemed like a road block of what to do about our sweet Rosie whenever we jetted off to some exotic destination. Enter the RV lifestyle! We could travel the continent in the comfort of our own home, change our location whenever the urge took us, eat healthy home cooked meals and, best of all, take Rosie with us. There are many different types of RV’s to consider and purging all of your belongings down to fit in the RV of your choice is not an easy thing to do. But it was the avenue to adventure that seemed the best fit for us and we hit the road in September of 2012. Rosie enjoying the great outdoors. When we had a house Rosie was only allowed outside when we could watch her and we wanted to continue to allow that type of exploration on the road, but felt she needed to be under better control for her safety (think rattlesnakes). We tried several harnesses but they had thin straps that she was able to squirm out of. Then we discovered The MetPet Cat Walking Jacket. It is substantial enough that she has a very hard time wiggling out of it once it is snugly fitted to her body. We also wanted a leash with some forgiveness. When using a normal six foot leash, if she got scared and bolted, she would hit the end of the leash abruptly, making her even more scared. We found a bungee-style leash that allows for a softer landing in the event of a kitty freakout. 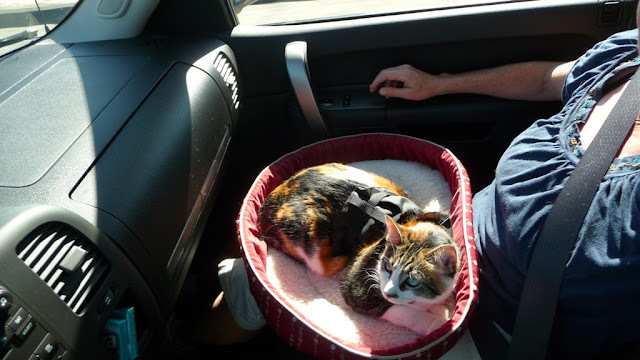 A snug fitting harness and bungee leash keep Rosie safe. Cats can be easily leash trained as kittens, but an adult cat is much more cautious. For several months we let her get used to the harness and leash. Now, after eight months on the road, we’ve learned that we don’t walk Rosie – she walks us. She prefers sticking next to protective objects such as vehicles or bushes, as opposed to wide open spaces. We must have patience when we walk her because she frequently stops to observe things for a while. I’ve come to see it as a meditative experience because we move so slowly! 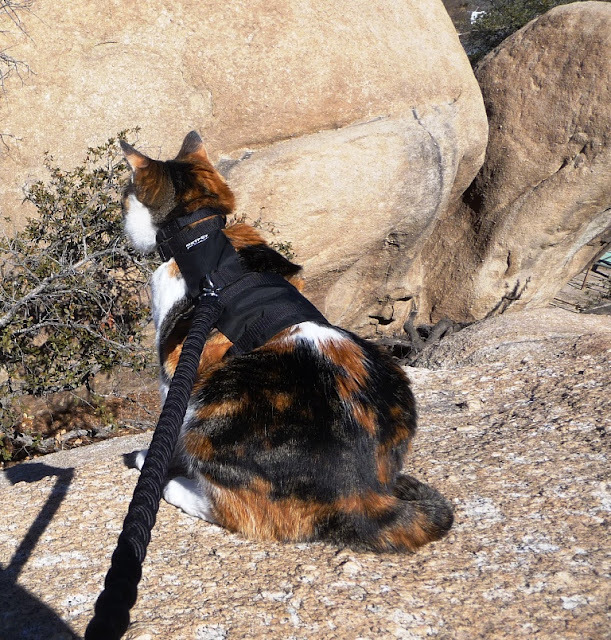 Lots of exploring for Rosie at Catalina State Park. Our RV of choice is a 5th wheel trailer which is pulled by a truck. Rosie rides in the truck with us and usually meows a little at the beginning of the ride. She wears her harness and we keep the leash handy so we can snap it on before we open the doors and she has a chance to scoot out. We also keep her soft cat carrier in the truck with us, just in case of emergencies. I ride with a cat bed on my lap and she lays there most of the time. On travel days after Rosie has breakfast I take away the food and water a couple of hours before we get on the road. I also try to get her outside for a walk before we leave because it works off some of her energy and makes for a calmer kitty during the ride. One of the biggest challenges to RVing with a cat is where to put the litter box. Some RVers put it in the shower; some designate a cabinet for the box and cut a hole in the door; it could go in a corner of the bedroom or back in the corner of the dining area. We were fortunate that our trailer had enough room between the two recliners for a litterbox cabinet. Multi-purpose functionality wins every time in a small living space! Rosie, sitting on her scratching pedestal behind the litterbox cabinet. We all know cats love to scratch and we struggled to keep Rosie from shredding the furniture. We discovered double-sided anti-scratching tape, which you can see on the chairs in the photo above. We also created a cat scratching wall by stapling a small rug to the end of a kitchen cabinet. Problem solved! Living and traveling in an RV with a cat took some planning and ingenuity, but every bit of effort has paid off; we are all enjoying this lifestyle in the comfort of our own home on wheels. We are living the life of our dreams and sharing it with our best buddy, Rosie, what could be better than that? Author Bio: Lisa McGuire travels full time in an RV with her husband, Hans, and cat, Rosie; blogging about their adventures at Metamorphosis Road. I’m sorry your first trip out was a rough one, Karen. I’m glad your finding these suggestions helpful and I wish you all the best of luck!